Dorothy Savarese tells a story about a humbling discovery she made shortly after moving to Cape Cod and how it reflects the heart of community banking. She already had 16 years of experience in economic development and at a large regional bank in the Midwest. She had taught credit analysis on a national basis. So when she arrived on the Cape and started work as a commercial lender at the Cape Cod Five Cents Savings Bank, “I looked at the credits here and the way they had been written up in the past, and they certainly didn’t meet my standards of documentation or credit underwriting,” she says—noting that they were short on financial analysis and long on character analysis. 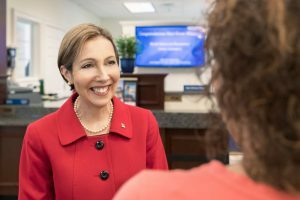 That early episode in Savarese’s community banking career might be one small moment, but it’s a clue to the kind of banker—and leader—she is today. She combines a relentless focus on getting the small stuff right with a deep, big-picture understanding of the people and places her bank serves and a humble, inclusive style. And as Savarese—who has been chairman, CEO and president of Cape Cod Five since 2005—prepares for her year as ABA’s chairman, she is bringing that detail-oriented, forward-thinking and collaborative style to the challenges facing the entire industry. Although Savarese grew up in a large Irish- and Italian-American family in northern New Jersey, she moved far from the ocean as a young adult when—a year before her high school graduation—her parents moved the family to a small town in northern Kentucky. After graduating from nearby Thomas More College, she got a job in municipal politics in Covington, Ky., just south of Cincinnati, then worked for several years in economic development in Cincinnati and other cities in the Midwest. Her work as an economic development consultant took her across the country, where she began developing a banker’s sense for good—and bad—economic projects. (One of the funnier bad examples she spotted was an investor group that had bought a former bank branch with a plan to set up a funeral home inside and use the drive-through for visitations.) Savarese then parlayed her work in economic development into a job with Cincinnati-based Fifth Third Bank. By the early 1990s, an opportunity took her family—which then included her infant son, John—to Cape Cod. After a year at home with John, she decided to get back into banking. Cape Cod Five—a mutual savings bank dating to 1855—hired her in 1993 as a part-time commercial lender; she picked the Five because of the flexible schedule and because of what she would later articulate as its “five pillars” of commitment to the community: local banking, responsible business, corporate leadership, financial education and philanthropy. Savarese gets choked up when she speaks about her mentor at Cape Cod Five, Bruce Hammatt, “who was so good about confronting me in a candid way and drawing the best out of me and challenging me to be a better person all the time.” With his advice, her career shot forward. She picked up an MBA from Suffolk University while working full-time; became head of product planning, where she spearheaded the bank’s move into wealth management, a strategically important area as affluent retirees continued flocking to the Cape; and was named chief operating officer in 2004. She was also making a strong impression on other leaders. 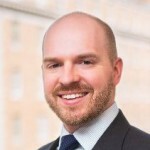 Tom Evans was then the head of school at a local private academy, and he got to know her in 1994 when the school needed a commercial loan. A decade later, he was part of the search committee to replace Cape Cod Five’s longtime CEO. If you spend just a few moments with Savarese, you’ll see clearly that she sweats the small stuff—emphasis on sweating. Her days start around 5:00 a.m. with running on her elliptical and reading seven daily papers on her tablet. “It’s not at all unusual for us to receive a 5:30 a.m. email from Dorothy when we know she’s on her elliptical,” says Evans. If she’s not on the road to one of Cape Cod Five’s 21 branches and offices, which span from Wareham, Mass., to Provincetown at the tip of the Cape, plus Martha’s Vineyard and Nantucket, Savarese works out of one of her two offices—the bank’s operational headquarters in Orleans or at its branch in Hyannis. Savarese is gifted in combining an eye for detail with a big-picture strategic vision—especially one that encompasses the diverse environment where she operates. Cape Cod and the islands are unique places. While today they have tourism-driven economies, they also have large historical sectors in fishing and farming, as well as growing health and education sectors. Banking on the Cape requires a deep understanding of this. Bankers there must master seasonal economies and their cycles, provide for the backbone businesses that serve and employ year-round residents and meet the needs of the affluent retirees and visitors. In the late 2000s—in the midst of the financial crisis—Savarese was key to Cape Cod Five’s partnership with Wequasset as the lead lender in a multimillion-dollar expansion and renovation project. “They understood our vision, they listened to us, they took risk with us,” says Novota. “And it’s been rewarding because we feel like they’re true partners.” Earlier this year, the newly expanded and enhanced Wequasset became the first resort on Cape Cod to receive a five-star rating. 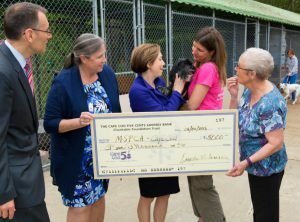 Savarese presents a donation from Cape Cod Five’s foundation to the MSPCA pet adoption center in Falmouth, Mass. “Whether it’s through our banking, through our corporate leadership and volunteerism, our financial education, our philanthropy, or even our business practices, we feel that everything we have to do has to contribute to the vitality of our community,” she says. But she’s best known for tackling cross-cutting issues with a banker’s perspective, whether it’s revamping the Cape’s wastewater strategic plan or tackling opioid abuse, which—as in many other New England communities—has claimed far too many lives on the Cape. She brings that to every business discussion, her team members say. “She is always wanting to get everyone’s opinions and everyone’s thoughts at all levels of the organization,” says Andrea Ponte, the bank’s chief strategy and operations officer. That commitment to dialogue and collaboration is reflected in Savarese’s commitment to build more opportunities for women in banking. As a mother of a young child when she started her Cape Cod Five career, she had a then-rare opportunity to work part-time as an officer of the bank. “As I progressed through my career at the bank into a position of authority, I wanted to ensure that we continued that commitment to allow families to go on the journey and support family values and at the same time keep that talent in the bank,” she reflects. Perhaps ironically, while Savarese often speaks today at women in banking conferences and has been named multiple times to American Banker’s list of the most powerful women in banking, it took some prodding for her to put herself out there as a spokesperson for women in her industry. After she was named CEO in 2005, “I said, ‘I do not want anything made of the fact that I am the first female president of this 150-year-old bank. I’m not a woman banker. I’m a banker,’” she recalls. When Savarese takes office as ABA’s chairman—only the second woman to do so—she will bring that hard-working, intelligent, collaborative and empathetic leadership style to the entire industry.